A Diamond Select Release! 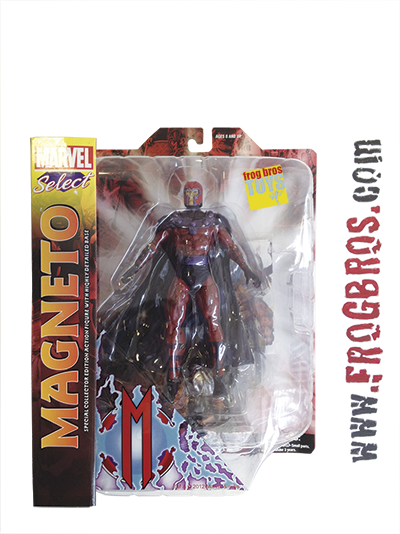 The ranks of the bestselling Marvel Select line expand to include one of the most deadly mutants ever, a man that has single handily defeated all of the Marvel heroes and has ambitions to wipe out the human race the Master of Magnetism, Magneto! Sculpted by Gabriel Marquez, this 7 depiction of the infamous enemy of mankind depicts the powerful mutant in all his glory, captured postbattle via a special display featuring the body of a fallen enemy buried under rubble. Featuring Marvel Selects standard 16 points of articulation, Magneto, and the sanshelmet chase variant figure, are the textbook definition of magnetism incarnate!